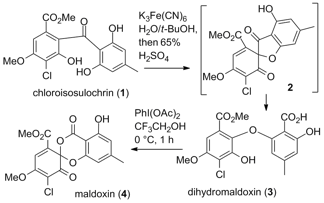 In their recent Organic Letters paper entitled the Syntheses of Chloroisosulochrin and Isosulochrin and Biomimetic Elaboration to Maldoxin, Maldoxone, Dihydromaldoxin, and Dechlorodihydromaldoxin, the Snider lab at Brandeis developed an efficient biomimetic synthesis of maldoxin (4), the biological precursor of several cytotoxic natural products recently isolated from the plant endophytic fungus Pestalotiopsis fici. Chloroisosulochrin (1) was synthesized for the first time and elaborated to maldoxin (4) by a three-step biomimetic route consisting of oxidative cyclization to give spirofuranone 2, acid catalyzed ring opening to yield dihydromaldoxin (3) and a second oxidative cyclization to form maldoxin (4). Electrophilic chlorination of phenols usually takes place unselectively at both ortho and para positions. For the synthesis of chloroisosulochrin, they developed an ortho selective chlorination using 2,2,6,6-tetramethylpiperidine and sulfuryl chloride. Presumably a hindered N-chloroamine is formed, which hydrogen bonds to the phenol and delivers electrophilic chlorine intramolecularly. The lycopodium alkaloids are a large and extensively studied alkaloid family. Huperzine A (1), the medicinally most significant lycopodine alkaloid as a potential treatment for Alzheimer’s disease, functions as an acetylcholinesterase inhibitor but may have other roles as has been addressed in several recent reviews. Sauroine (2, 7,8-dihydroxylycopodine), from Huperzia saururus, was reported in 2004 and shown in 2009 to improve memory retention in the step-down test in male Wistar rats, significantly increasing hippocampal plasticity. 7-Hydroxylycopodine (3), from Huperzia serrata, was also reported in 2004 and may have related biological activity. 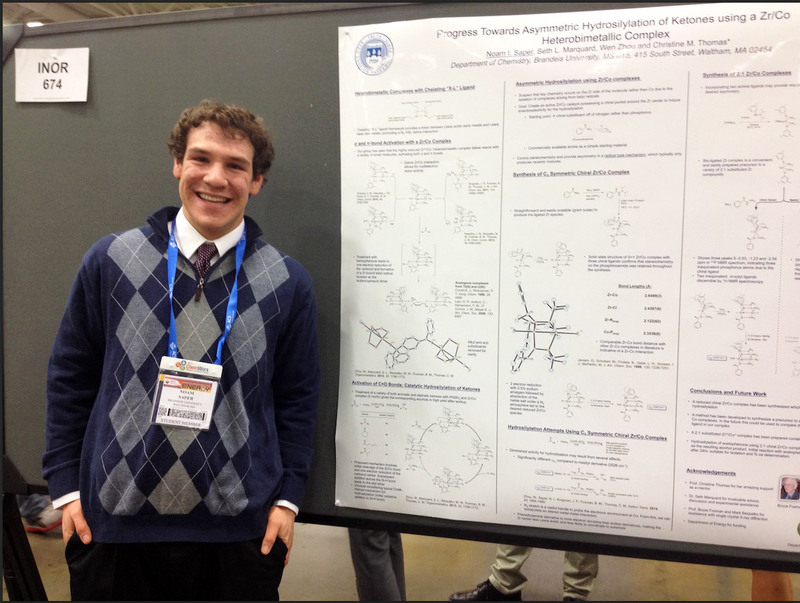 In their recent Organic Letters paper entitled the Synthesis of (±)-7-Hydroxylycopodine, the Snider lab at Brandeis developed a new general route to these bridgehead hydroxylated lycopodines. They reported a practical six-step synthesis of 7-hydroxylycopodine which makes it readily available for further biological evaluation. The key step of the synthesis is the treatment of bicyclic enol ether 4 with 60% sulfuric acid that affords tricyclic amino alcohol 5, which is further elaborated to 7-hydroxylycopodine (3) in three steps. 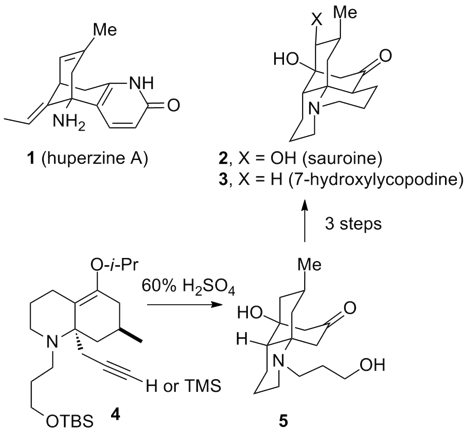 The application of this route to the synthesis of sauroine (2) is now under investigation. IIn 1992, the lab of the late John Daly at NIH reported the isolation of epibatidine (1) from the skin of an Ecuadorian poison frog. In addition to being a toxin, epibatidine has potent analgesic activity. Subsequent studies showed that this activity resulted from interaction with acetylcholine nicotinic receptors (nAChRs) with binding to some of the receptors at sub nanomolar levels. The binding to several different types of nAChRs may be responsible for its non-selective activity. In 2010, the Daly group reported the isolation and tentative structure determination of the epibatidine congener phantasmidine (2) from a total sample of only 20 micrograms. Preliminary biological studies with the limited material available indicated that phantasmidine (2) differs from epibatidine (1) by being selective for β4-containing nicotinic receptors, suggesting that phantasmidine might fill a niche for characterization of these receptors. However, the limited natural material available precluded detailed pharmacological analysis and definitive structure determination. 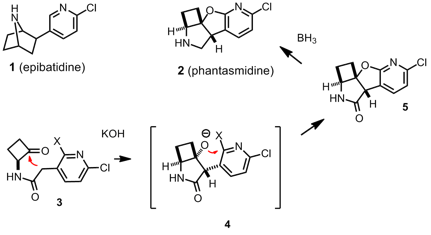 In their recent paper in Organic Letters entitled the Synthesis of Phantasmidine, the Snider lab at Brandeis reported a short and efficient synthesis of phantasmidine that confirmed the tentative structure and makes ample material readily available for further biological evaluation, which is currently in progress. To prepare the tetracyclic framework, they invented a new tandem intramolecular aldol reaction-nucleophilic aromatic substitution reaction to form both five membered rings in a single reaction. Treatment of keto amide 3 with sodium hydroxide gave aldol adduct 4 which cyclized to lactam 5. Reduction of the lactam completed a practical synthesis of phantasmidine (2).